LAURA Geitz has retained her place in the Australian squad to train for the Holden Netball Test Series, featuring the Constellation Cup and Quad Series. Geitz debuted for Australia in a Test on October 4, 2008, against England in Newcastle, before missing some internationals in 2009 with a hand injury. In 2010, she won silver in the Commonwealth Games and gold last year in the World Championships. 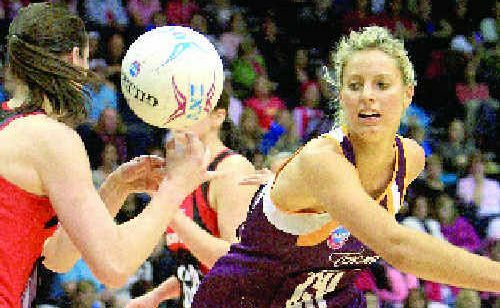 She will be joined in the squad by two Queensland Firebirds teammates, Natalie Medhurst and Chelsea Pitman. The squad of 22 will travel to the Australian Institute of Sport in Canberra from August 8 for Diamonds Camp in the hopes of being selected in the team for 2012. Geitz will be joined by fiancee Mark Gilbride, her parents Ross and Juanita Geitz, sister Carla Pidgeon and grandmother Betty Ball at tonight's Firebirds presentation dinner. Her mother Juanita said it was good to see Laura back in the squad even after a disappointing Firebirds season. "I think Laura is playing as good as ever," she said yesterday. Brisbane has missed out on 2012 Diamonds matches. The closest is Newcastle on October 17.